Born about 1775, Barnett Himes is the earliest known member of the Himes family. It appears he was also known as Isahkar Himes. He was a tailor in the City of London. His wife was Anna, who was born in 1791 in Portsea, Portsmouth, Hants. It appears that the Himes family shifted to Devon, Exeter from London around 1819 and remained there for a number of years before returning to London again after 1829. 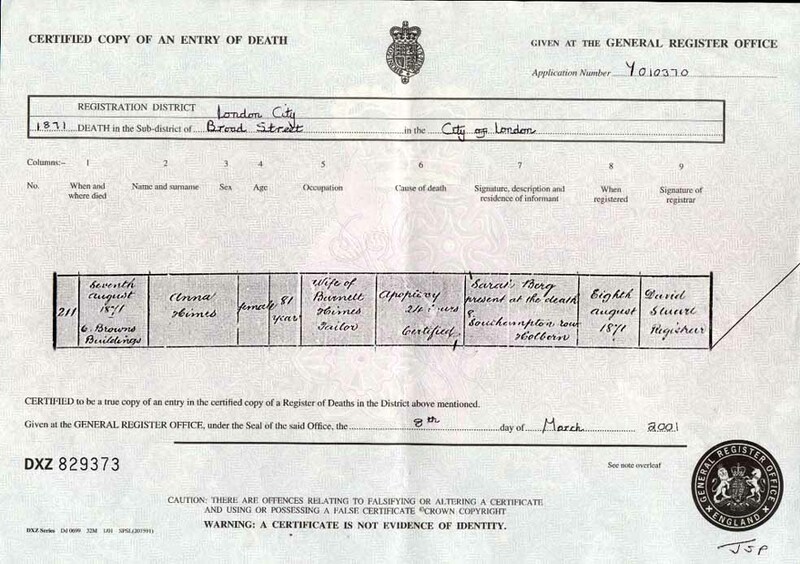 Census records show that he lived at 16 Bury Street, and at 7 Browns Buildings. 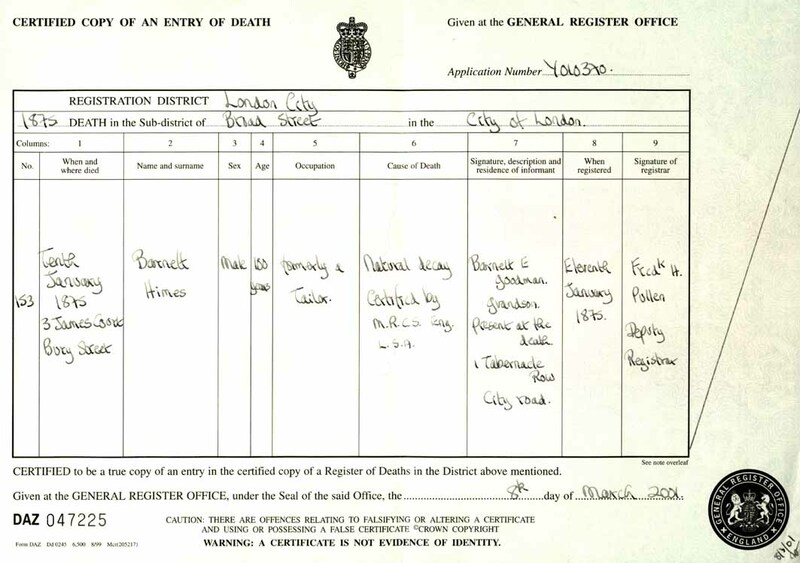 Barnett’s death certificate shows that he lived to the remarkable age of 100, and died on the 10th January 1875. 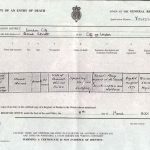 Anna also lived to a good age, and her death certificate shows that she was aged 81 when she died on the 7th August 1871. Edward Himes was born in 1818 in Portsmouth, Hampshire. He married Emma Moss on 3 Nov 1847. The 1851 Anglo-Jewry Database notes that he died on 24 June 1861, by accident thrown out of a carriage (sourced from Berger, ‘Jewish Victorian 1861-70’ ). Louisa Himes, the oldest daughter born around 1819, married David Goodman. 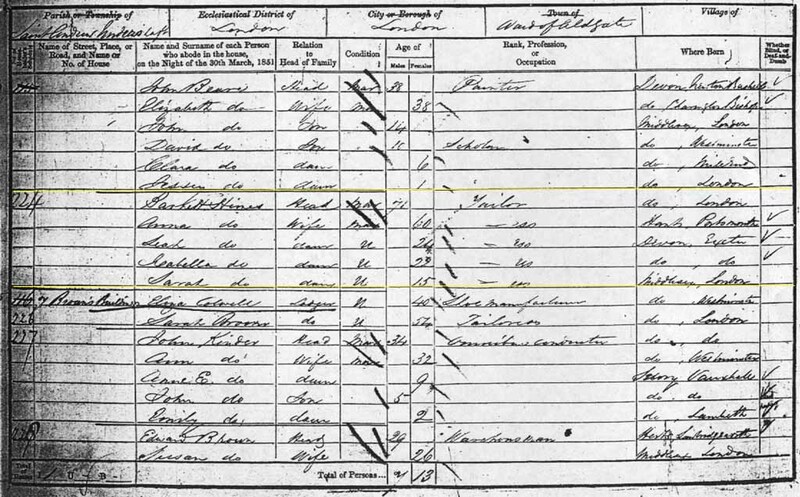 The Goodman family lived in Wales until at least 1851, but may have later emigrated. Leah Himes, born possibly in 1827 in Devon, married Jacob Bloom. 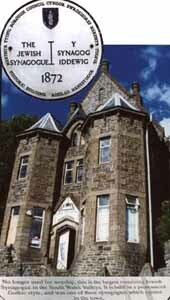 Before emigrating to New Zealand in 1879, they lived in Merthyr Tyfil, Wales. 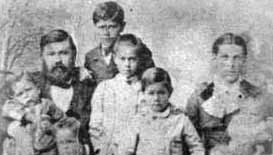 Several generations of the Bloom family lived in Wales, before moving to other parts of the United Kingdom, South Africa and the United States. Isabella Himes, probably born in 1829 in Devon, married Yomtob Levi Bensheton. The Levi family decided to drop the full Levi Bensheton surname. Yomtob and Isabella’s daughter emigrated to New Zealand with the Bloom family. Apart from some family members who remained in Wales, there are no other known descendants. Sarah Himes was Barnett and Anna’s youngest daughter, born circa 1836 – 1842, in Aldgate, London, Middlesex. 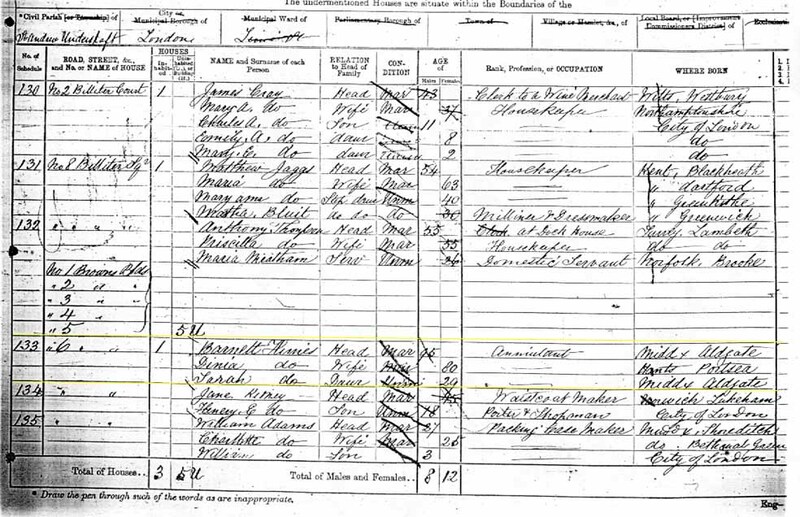 The 1851, 1861, and 1871 censuses show her living with her parents at 6 Browns Buildings, City of London. 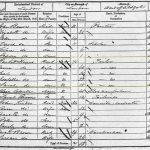 By the time of the 1871 census she was aged 29, but no further records have been found after this time. There is a possible matching death record for a Sarah Himes, aged 50 in Mile End Old Town in 1892. Louisa, Leah and Isabella were all some time residents of Merthyr Tydfil or elsewhere in Glamorgan or adjacent counties. 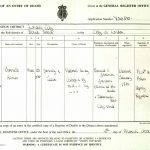 There are also links with the Barnett family of Glamorganshire. 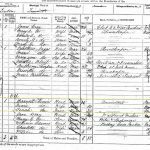 Isabella’s daughter Emilie Sarah Levi was at first a governess to Barnett family (Henry, Louisa and children) 10 Heathfield St (1881 census), and later a lady’s companion family 5 Heathfield St Castle (1891 census).